Your typical "how much excess can we cram into one sitting" type film. The movie is all about non stop drug use, cursing, theft and a criminal lifestyle purportedly portraying that of the Wall Street stockbrokers during the 80's. The movie was kept on track by DiCaprio's vigorous performance, but the end result is still predictable. I knew exactly what would happen in every scene. It really is an exercise in how much debauchery can we show all at once. The Wolf of Wall Street was an enjoyable movie. Martin Scorsese is probably my favorite director of all-time. 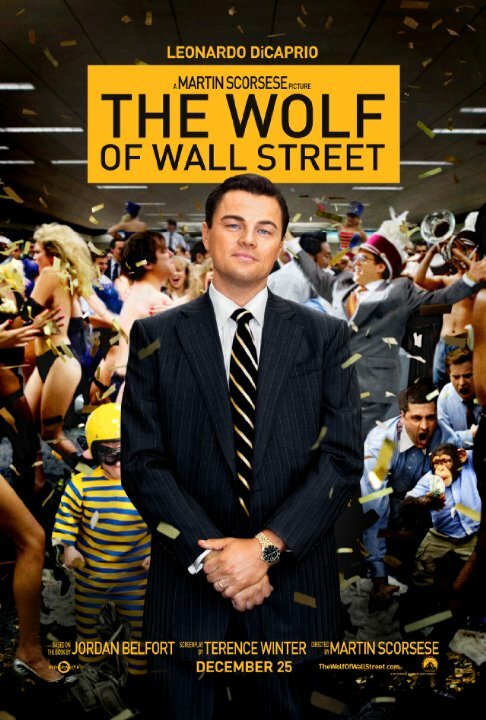 Leonardo DiCaprio gives a powerhouse performance as Jordan Belfort. I did notice the film started to drag in the middle. overall I give The Wolf of Wall Street A-. Not sure I can condone the message the movie sends - excess, money, debauchery, drugs - it's not exactly a shining example of humanity - but damned if I wasn't entertained. The characters, though despicable, truly are great to watch - with DiCaprio and especially Jonah Hill turning in fantastic performances. Repulsive, ridiculous - maybe - but depravity is so much better when it's not far removed from the truth and, admit it, if you were in their shoes, you would do the same f@*king thing. No posts have been made on this movie yet. Be the first to start talking about The Wolf of Wall Street!